Regular readers of Eye might think that we’ve got a little carried away with the ‘s’ word. Nearly every new issue seems to be labelled a ‘special’, whether it’s concentrating on images, technology or type, and from time to time we descend upon some unsuspecting subject such as ‘publishing’ or ‘brand madness’. 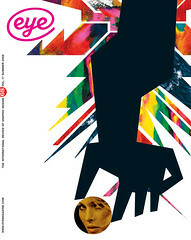 But, to misquote Orwell, all issues of Eye are special, but some are more special than others, and this edition marks some very important changes in the way our magazine is looked after. For the first time in Eye’s seventeen-plus years, the title is owned and managed by the people who make it. We have achieved this, not through a coup, a fire sale or complex financial shenanigans, but through the more straightforward route of a management buy-out (MBO), which is more like an amicable divorce than anything. It’s not going to set the financial and media websites aflame with gossip, and it has taken time, and it is a fair and relatively unstressful way of ensuring that the magazine can grow and prosper. Once you have sorted out who’s got custody of the back issues (we have) and divided up the furniture (they kept the desks, we have the chairs), we can make sure that the magazine’s ‘extended family’ of readers, contributors, advertisers, sponsors and other supporters will regard this as a change for the better. Which of course it is. I was dying to let you know in the editorial for Eye 67, but the pages went to press before the details of the MBO had been finalised. We want to be sure that every subscriber is happy with the service they get, from the cardboard box used to deliver their copy, to the quality of communication. The editorial contents and art direction will be as good as ever, possibly better, because all our contributors are excited and heartened by the change of ownership, and working hard on imaginative and stimulating commissions for the next few issues. And we’re also going to invest more time, energy and creativity in the Eye website. In addition to the existing site, which is an index for Eye’s rich treasure trove of articles, reviews and essays from archive, we are launching the Eye blog, which will be up and running soon after this issue reaches you. The blog will feature up-to-the-minute reviews, extracts from the archives and thoughtful entries about every subject embraced by Eye: graphic design, typography, photography, advertisements, branding, Web design and visual culture in general, plus new writing about subject matter that is difficult to show in context on the printed page: animation, interaction, film titles, exhibition design, and so on. It’s your blog, so we want you to feel part of it, with a Twitter feed to keep you posted about the progress of the quarterly printed magazine.